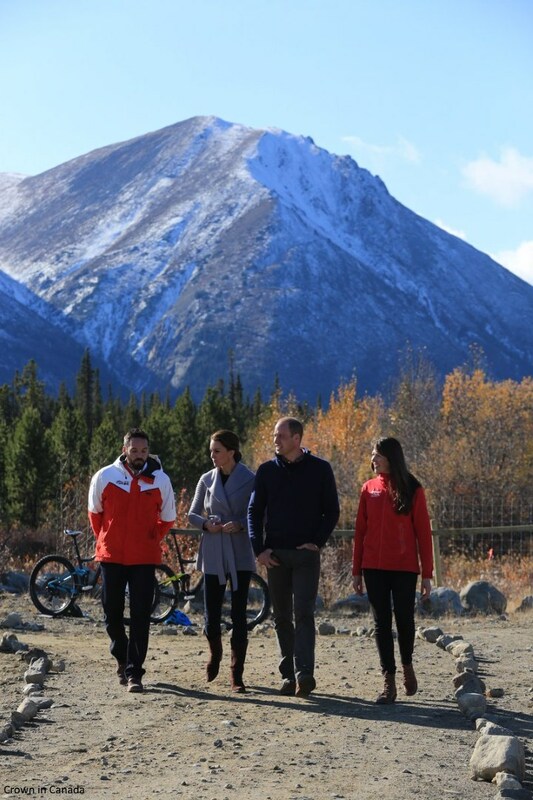 It was a change of clothes for the Duchess before she and William travelled to Carcross for the second leg of the day. The Duke and Duchess received an elder blessing, and experienced a display of song and a welcome dance by the Dakhká Khwáan Dancers. The royals clearly enjoyed the ceremony very much. Kensington Palace posted this beautiful photo - the Duke and Duchess will be visitng the "stunning Carcross Commons and Montana Mountain". 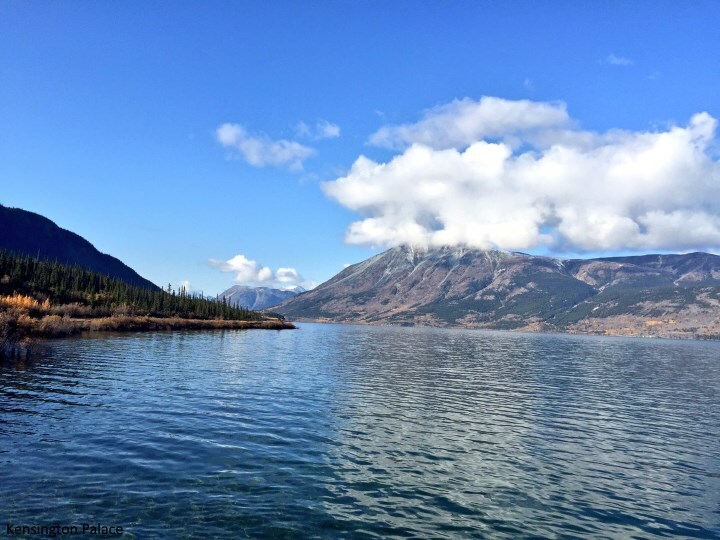 A little background on Carcross: Caribou Crossing was a fishing and hunting camp for Inland Tlingit and Tagish people. 4,500-year-old artifacts from First Nations people living in the area have been found in the region. Caribou Crossing was named after the migration of huge numbers of caribou over the natural land bridge between Lake Bennett and Nares Lake. That caribou herd was depleted during the Klondike Gold Rush, but a recovery program raised the number of animals to about 450. The modern village began in 1896, during the Klondike Gold Rush. At the time, Caribou Crossing was a popular stopping place for prospectors going to and from the gold fields of Dawson City. Caribou Crossing was also a station for the Royal Mail and the Dominion Telegraph Line, and it served as a communications point on the Yukon River. The small town is home to less than 300 people. Kate was given a beautiful bouquet of flowers as they walked through the town. William and Kate were given a totem pole to take home. The Duke and Duchess with Chief Carvill. 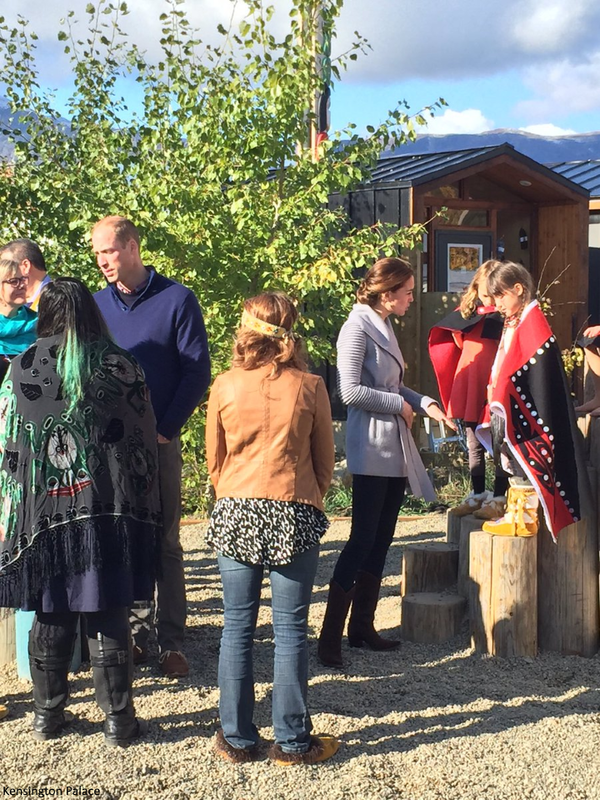 The Duke and Duchess met a carver who is working on traditional Inland Tlingit and Tagish totems. He discussed the work that goes into making each totem pole. After hearing about the traditional Inland Tlingit and Tagish totem project, the Duchess painted an eye on a totem pole. 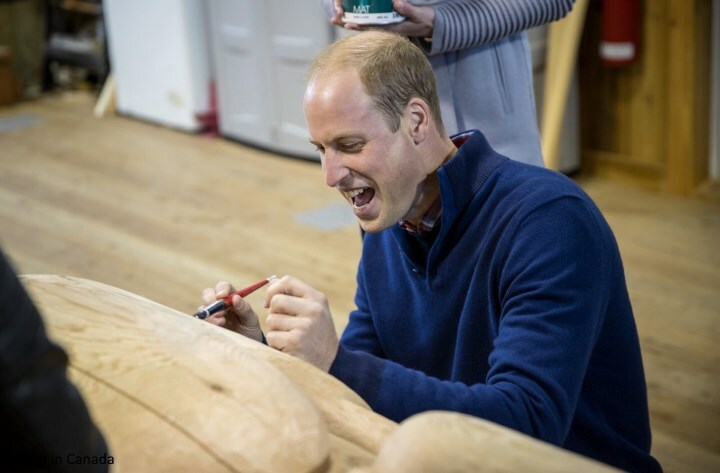 Prince William showcases his artistic skills. 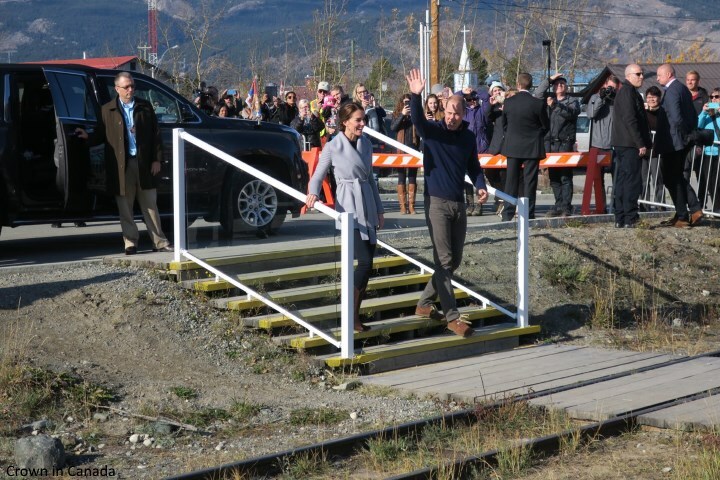 Emily Nash reports "William and Kate climb out of the cab of a steam train on the White Pass and Yukon Route in Carcross. It was an unplanned stop but the Duke couldn't resist climbing on board and each had a go at blowing the steam whistle! The Queen and Duke of Edinburgh travelled in one of the carriages during their 1959 visit to Yukon. Choo choo!" 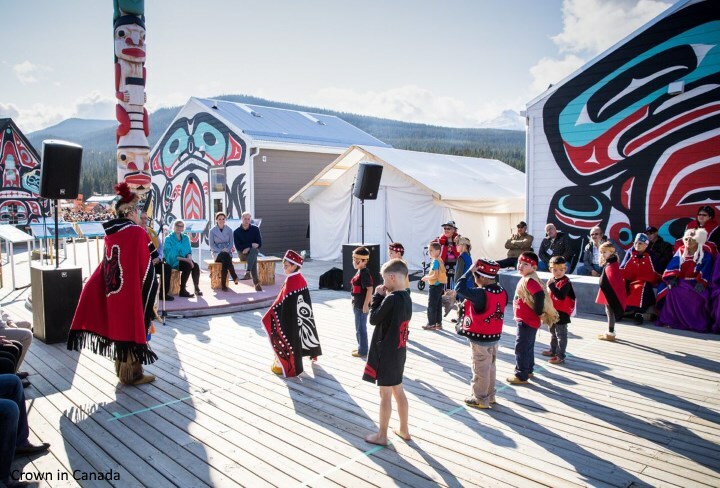 The children of Carcross Commons showed off their new playground. The Duchess meets local schoolgirl Okasana Baerg. 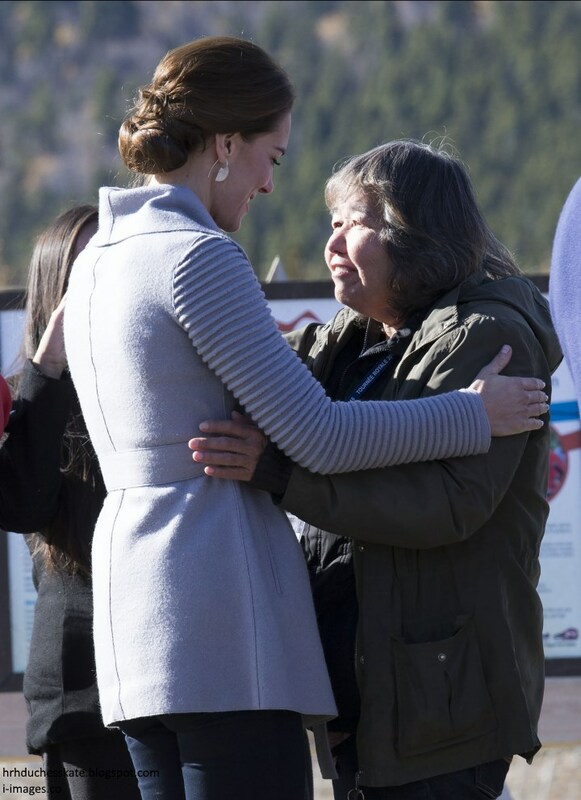 At Montana Mountain, the Duke and Duchess received hugs from locals. 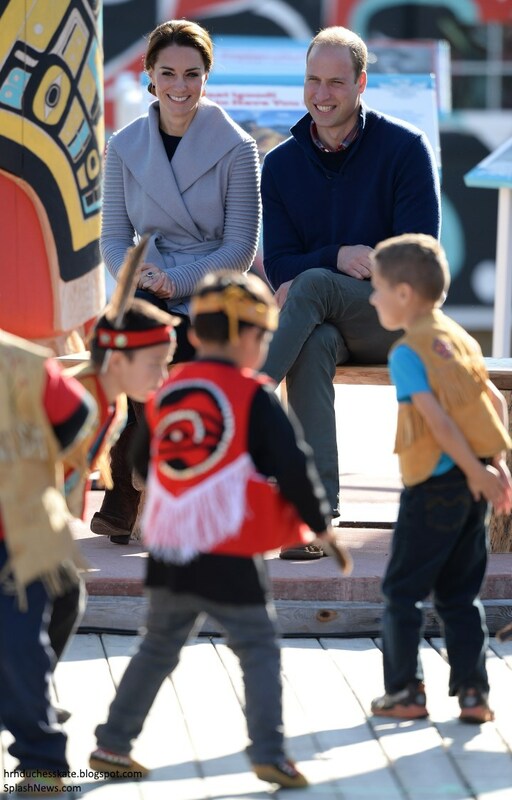 This is one of my favourite photos of the tour thus far; it's such a lovely picture depicting how warmly William and Kate have been received across British Columbia and Yukon. 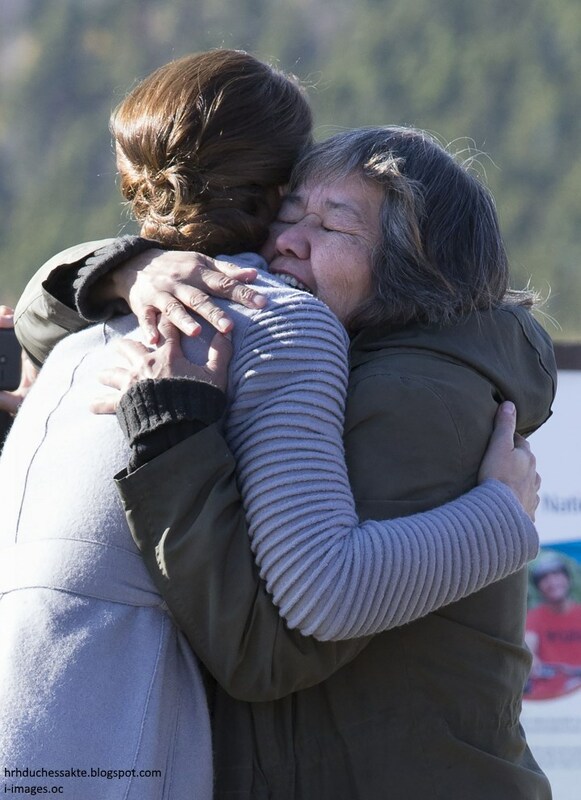 'Gwen Wally, 48, from the Carcross Tagish First Nation shouted out to Prince William, interrupting as he and Kate were chatting to her son, Shane Wally. "I love you. I loved your mum. I've been watching you since you were little," she shouted. "Is that your mother?" William asked, laughing. "That is my mother," Shane, 26, said slightly awkwardly. "I was pretty nervous but also pretty proud. She is their biggest fan," he said after talking to the couple about a mountain bike trail scheme his family helped to set up at Montana Mountain in Carcross, Yukon, in northern Canada. They watched a mountain biking demonstration atop Montana Mountain with the Single Track to Success (S2S) project which not only builds world class trails, it provides life-changing experiences to local youths and contributes to tourism in the area. The Duke and Duchess met young riders. Montana Mountain really is breathtaking! The Duchess championed Canadian brands for her second ensemble of the day. 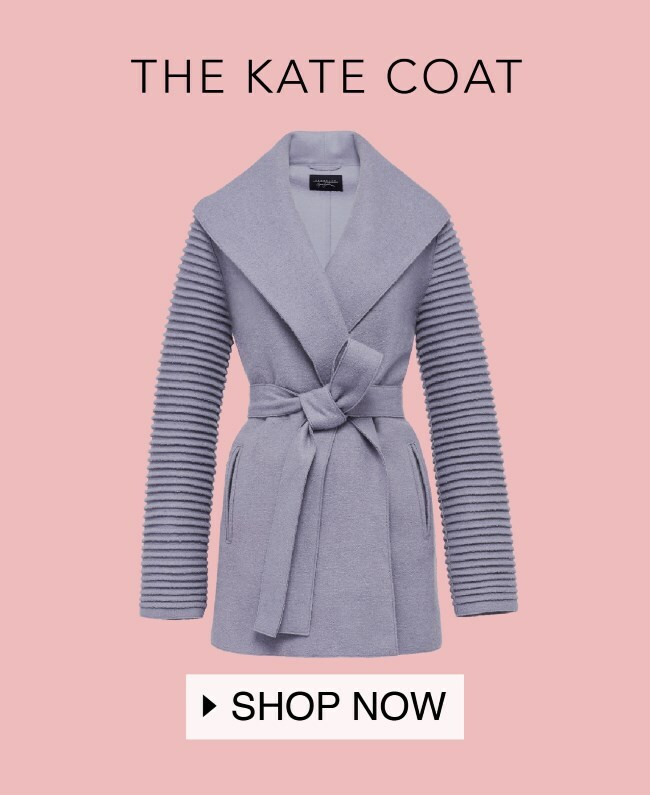 The brand confirmed Kate wore their Ribbed Sleeves Wrapped Coat - it has now been renamed the 'Kate Coat'. The $920 'gull' coloured coat is described: "This double-faced superfine alpaca wrap coat has the Sentaler signature ribbed detail on sleeves. It is the perfect statement piece." The coat features a belted waist, shawl collar, two slit pockets at front and Sentaler signature ribbed detail on full sleeves. Kate's choice of Canadian designer Sentaler will come as no surprise to many of you who suggested the brand for Kate in our 'Choose Your Dream Tour Look for Kate' posts. In fact reader 'Sonshine' actually predicted the exact coat in pink. The Duchess donned a pair of brown cowgirl boots. They are the R. Soles Virgi Chocolate Suede Boots. 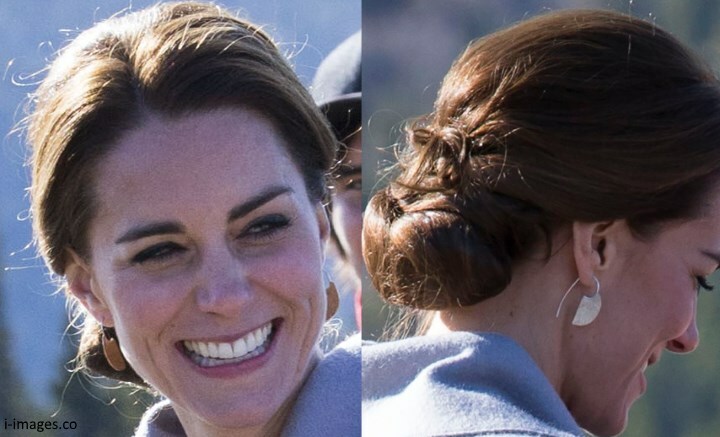 Kate's new earrings are by local Yukon designer, Shelley MacDonald. 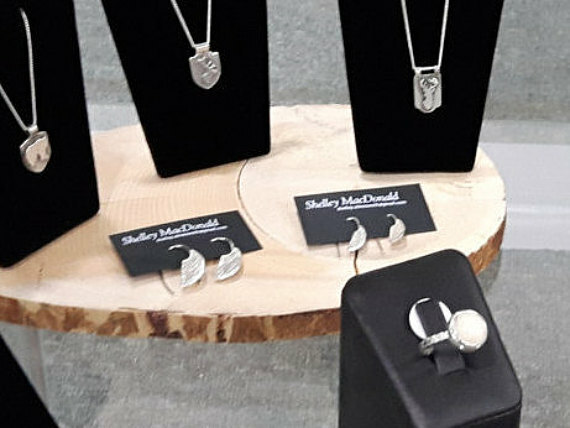 The $95 Ulu earrings are available to pre-order on Shelley's Etsy Page - her designs are inspired by nature and handmade. Kate's Closet spoke with a representative for the brand who revealed the earrings were for sale in a store in Whitehorse and must have been purchased by Kate or a member of her team. A product shot of the earrings. Tomorrow promises to be a particularly exciting day - George and Charlotte will accompany their parents for a children's party at Government House. It's scheduled to begin at 10 a.m. Loved every thing about this stop! The warmth of the people there and seeing that returned by W&K, the scenery, the spontaneous jumping on train, the coat, the stories of the interactions - wonderful!! All in all this look was a miss for me, personally! Well, they were in an old frontier town (whitehorse) and this one is near by, in gold mining country. So I think Cowboy its right in. I agree with Rebecca. The look is perfect here, and blends in well with the locals. That's really important. I must say that I love these kind of engagements for William and Kate, it's where they shine. They both seem very much at ease today. :Like my boss used to say when one of her staff voiced a complaint about something in the department... "And what is your suggested solution???" You tore down Kates entire outfit piece by piece. So Anon, please tell us your suggested alternative piece by piece. I'm not anonymous, I think the jacket's OK, but she could have worn it with different pants and half boots. There are plenty of casual pants that aren't skinny jeans. They even have skinny pants. A black, grey or blue pair would have looked OK with a pair of cute half boots. What a nice change of pace! And such a warm welcome! It has been so interesting and educational to follow this tour and their travel closely and "meeting" all these people and cultures with them! I really like this look. The coat looks really odd in the stock pictures but when worn it works. And I saw someone mention at another place how well her updo works with this open collar and I really agree! Great to see her in two Canadian brands as well! Especially the smaller jewelry brand. I checked out her Etsy shop and she has some really cool stuff! I'm sure they are happy getting back to the kids now! I haven't had time to comment since returning from Vancouver, but I do have some VERY interesting tidbits to share w/readers! I went to dinner next door to my Vancouver hotel on Sun night and noticed 2 men behind me editing Kate pics. We recognized them as James Whatling & Mark Stewart - who are responsible for many of the gorgeous photos Charlotte posts on this blog! I introduced myself and bought them a couple drinks as thanks for all the wonderful pics they put out for us Royal followers. In return, they came and sat through dinner with me - Mark showing me unpublished photos on his laptop of the BRF!🤗 and telling me wonderful stories about his many years photographing them (sometimes getting hired for their private parties!) and James telling me fascinating stories about all the European Royals he's worked with in the past. Both have been on all the Cambridge tours so far & I've never been so engrossed by anything! I took a silly pic of me spying on them and then a real pic afterward that readers can find on my Twitter handle: StefanBerlyann5. It was so wonderful meeting people who have a great personal and working relationship with the BRF - specifically W&K! It made me believe all the stories relayed were legitimate and the 2 men could not have been bigger admirers. They have a true respect for them that really comes through in all the pics they take. James told me that I really have to give Camilla a chance, she's very warm & kind (and even bought him an ice cream a couple weeks ago!) and that he wouldn't be surprised if another pregnancy came soon! Do we dare to hope?!? He said he can really see the love between them when looking through the lens - they're the real deal. Ohhh it made me so happy to hear that! So to all the commenters who don't feel the pics of this tour show Kate as happy, rest assured the people that have been by her side every day feel otherwise. Wow! What a nice comment! I saw that James had dropped his camera and a lens, but they pack so many cameras and back up cameras so that should not be an issue! Appearantly he the same day managed to forget his laptop on the Royal Plane but KP, the Canadian Press Liason and some security got it back quickly to him. Not his best day at work I assume :P But very nice to hear about your chat! And what a fun time for you! Wow! Wow! & Wow! :) Berlyann That Is Amazing!!! I'm Pinching Myself Just Reading About Your Experience, I Can't Imagine How You Are Feeling Still? lol Wow! Did I Already Say That? lol Talk About A Memory For A Lifetime! I Am Soooo Happy For You & Thank You For Graciously Sharing it With Us! As A Fellow Photographer, I Will Definitely Be Praying For James! Berlyann - how wonderful for you!! I bet you had an amazing time! Thank you so much for sharing with us!!! Great story Berlyann! That must have been so exciting for you! And getting to see those unpublished photos of the BRF - how great is that! That's so sweet that they said W+C are really in love. Wow - what a great story! Thanks for sharing your encounter with the photographers. Thank you for sharing that amazing story. You're trip has really been so fun to hear about. Glad to know that what we always suspected is true and they are down to earth amazing people. I will join Becca in "A Jumping Up and Down Hug" to you Berlyann. What a dream come true. Again, what a dream come true. wow. wow. wow. I am SO happy for you. And it is so nice to know that those members of the press pack love William and Kate so much. awh. Thanks for sharing, Becca, so sorry for your loss. I would guess though that your children and grandchildren do not want for family photos. :) Just guessing. Wow, Berlyann, thanks so much for sharing your experience. What a thrill! I think it's lovely that they sat and chatted to you like that and shared their thoughts and images. You must have had a look on your face a bit like the lady in the hug photo! I join you in hoping James can still manage to get some great shots for the rest of the trip. I've been looking at the Twitter threads of some of the photographers and while they seem to take multiple camera bodies with them, they don't seem to double up on each size of lens. If his big lens is now broken, I fear he could be in a bit of trouble unless he can borrow or rent one from somewhere for a few days (and even then it won't be matched to his camera). It may not stop him from getting pictures completely though - if he can get close enough to use a smaller zoom he should still get something. Fingers crossed because his photo of Kate at the evening reception is one of the most stunning of the trip so far for me. The picture of Kate hugging the old lady brought tears to my eyes. This day really must have been amazing! Plus, I love the coat. And Berlyann, thanks for sharing! Reading about your experience made my morning. You must have been thrilled! How wonderful! Way to go, Sonshine! It's a beautiful coat. I like the pink better, but the gray is lovely, too. I love the earrings from the Yukon designer. And she's wearing cowboy boots! Yup, it is the west, for sure :). I like the way her hair is done, too. She's really looking good on this tour--polished and appropriate, stylish and accessible. It is, isn't it? Very sweet indeed. Isn't that an incredible photo? And you can't even see Kate's face, but, as you say Berlyann, the look on that lady's face is absolutely priceless. It made me all weepy too. You just know that she will be proudly telling the story of that encounter for the rest of her days. Lovely. I love this look! I think she looks completely relaxed, excited, and very comfortable. Like she can relax about the exterior appearance and focus on the people(or maybe I am just reading into it). The pic where she is hugging the mom! So fantastic. They both look so geniunely happy and excited by the conversation and hug. I have seen a few random posts about how boring this tour is. I have been thinking about it. It kind of is, compared to India especially. Cricket, artwork with kids, feeding animals on a safari. This tour is a lot of sitting and listening. Today seemed like the most fun, being out and about, having some freedom to jump into a train and talk to a variety of people. But let'a not lie, I check Twitter every 10 minutes anyways. Boring Schooling. Welcome to real life. Most of it is boring--unless you can see each moment for the miracle that it is. All along this tour there have been these numerous, personal-miracle moments. I was ten years old when I figured out that if something was boring or if I was bored it was because I did not have enough creative imagination in that moment to figure out or do that thing which was amazing. In small and random ways I've been amazed every day on this tour. Spell checker screwed up: boring schmoring. Wow Philly, I love your approach. "See each moment for the miracle that it is". That's my new life motto. I thank you. I don't think it's boring at all. Except for the part where you're constantly being photographed & in the media (I don't like that sort of thing), I'd love to do it ;-) I do love travelling and I think meeting and getting to talk to people from all sorts of walks of life, learning about the First Nations culture and history, getting to try different types of food and seeing such wonderful nature is incredibly interesting. I have disabled the spelling software because it made so many stupid mistakes! I will probably buy this coat if I do because I am in love with it! IN LOVE! This whole outfit is exactly my style! Good luckSarah. If you wind up purchasing it, let us know and what you think about it. I'm down to one pick a week so it isn't looking good lol but I still have a ray of hope! I think this is my favourite engagement so far. I love Kate's whole look (yay for a Canadian designer! ), the scenery is gorgeous, the people are so warm and welcoming and Will and Kate look so engaged. Charlotte, thank you for working overtime and for all your amazing coverage of the tour. There are a lot of other great Kate blogs out there but yours is by far the best! So happy to see a Canadian company in use and a great sweater - wonderful pick Sonshine, although I liked it in pink with the scarf - would have been a good use of that tartan scarf - I agree repeatedly carrying scarves seems odd. But it's such a thrill when one of the things that was styled on the blog shows up. Congratulations on a great pick Sonshine. Berlyann - what an exciting experience - and glad the man's camera issues sorted themselves out. Congratulations, Sonshine! Kate looks perfect for this leg of her trip, and you picked the perfect coat. It looks so neat and comfortable. I also like the earrings. And kudos to Berlyann! What is behind Kate when she is holding onto that steam train?? It looks like the edge of nowhere. That is what I thought Chic Designer. It honestly made me dizzy just looking at the photo because it looked like if they mis-stepped there was a big drop off. Thanks so much chic designer, I absolutely adore this coat! This coat is amazing! I bet Sonshine is over the moon excited that something she picked for Kate was worn. I really like the pink as well. Congratulations! Love the earrings as well. She did this on the Indian tour too. Picking up some local souvenirs to wear, remember the earrings from Bhutan? Such a great gesture to her hosts and easy enough to pack and carry back home. If you do find a reply-Kate, would you let me know? Hello! How fantastic Berlyann to have met the photographers and for the fellow commenter picking the coat! I specifically clicked on that coat when reading the post prior to the tour because I LOVED it, but was so disappointed to see it was so expensive and I couldn't get one! I was then STUNNED with happiness to see Kate wearing it today...but then sad again I couldn't add another Kate item to my closet. For all of you keen fashionistas -- has anyone found a "repli-Kate" of this coat? If so, please share in the comments or email me: ckeffer09@gmail.com as I would love have one! I'm enjoying this tour immensely and I love the coverage as always. Thank you Charlotte! I am interested in a repliKate as well ! Please post here if you find a close one. Now one remaining in extra small! They will perhaps re-order these coats, and they are so pretty and comfy looking. I recognized this jacket immediately, fashion blogger Rachel Parcell has worn it before! Oh wow, Kate looks comfy and relaxed and lovely of course! I sure hope they had fun today! Sorry for the duplicate question...I looked back and I know the link must be posted somewhere but I couldn't find it. Where might I find the live feed you all are referring to? I went to CTV but could not find. Thanks!! Well, she has two houses with quite a few rooms so I doubt she's lacking. And nah, she's reworn a fair bit, and for all we know we might see them pop up in 7 years or something. I mean, we've seen her in a dress from 2002, a hat from 2006, earrings from.. 2006? I think it was etc. So who knows what stuff she will pull out in the future :P But who knows, Hermione might have taught them a trick or two. I mean, Anne must have a time turner since she's basically at two places at a time! Getting dressed every day must be like going shopping. Funny story -- a couple years ago I bought maybe a dozen clothing items, but set them down and somehow forgot about them. A year on, I'm spring cleaning, and what do I find, but a shopping back full of those clothes! It was like Christmas! I don't know how to do Twitter. Can you get that photo posted here, Berlyann, Charlotte????? LOVE the coat and earrings! So pretty and elegant! I love the pics of her hugging the locals... what a beauty inside and out! Berlyann, what a memorable dinner! Thank you for sharing your account of meeting James and Mark. I enjoyed reading their insights, especially the genuine love they witness between Kate and William. Thanks you Kim (and everyone else) and I agree, I also prefer it in pink :) but at least with a scarf please! Yes, clarity would be nice. In the photo by the train, it looks like quite a drop right by them. Surely there wasn't. Someone tell me there wasn't. The river current? hypothermia? how much of a drop? Thank God they didn't slip. Anyone know how much of a drop that would have been? About 20 feet or so maybe over an cold lake. Thanks Charlotte. I have been keeping up with my iphone and television and reading all the mostly lovely comments but havent really had time to comment myself. Everyone has been wonderful commenting on this memorable Royal Tour. Looking forward to seeing those precious two children, Prince George and Princess Charlotte tomorrow. Can't wait. Great pick Sonshine! You and Kate must think alike:-) Love the coat. Not crazy about the western boots. I think a great pair of black riding boots would have looked nicer. Wow! I really like this look. I'm so excited that 'Sonshine' selected something that Kate wore. When I saw this post in our "stylist looks" I liked the look of the sweater coat. Not surprised that Kate chose gray. She'll be walking the street of London with this one carry her gray Tod purse. And it's a great for - dare I say it? - upcoming pregnancy. It appears that Will and Kate are having a great tour. They seem to really be flourishing and I hope a night off from the kids is a benefit as well. oh i just love this coat and the color to it looks really good with her hair back and i think the boots are great. my favorit picture is her hugging the woman it really touched my heart will and kate are just such lovely people it just seems that anywhere they go they bring sunshine to everyone they meet when i see william with the chrildren and how he really care's it brings tears to my eyes. just a beautifull and wonderfull day. thank you charlotte for all your hard work. Two of the photos on this page are from Chris Jackson, Natasha's fiancé'. Do you think they get to see much of each other as they both on the tour with Kate and William. Their interaction with everyone was so moving. I loved this part of the day. Kate is so very compassionate. The outfits, though secondary to the day activities, were fine. But, to me the whole point was the people, and their history, and the two of them reacting, and focusing on them. I love that coat! That is fabulous that one of our own, picked it. I'm not ashamed to say I did a little jig yesterday when I saw the first pictures of Kate in this Sentaler coat. It's a brand I hadn't heard of until the run-up to this tour, but since Sonshine mentioned it I went and had a look at the website - and drooled! What beautiful, classy and wearable pieces. I think if I had Kate's budget I'd have bought one of everything! I'm so thrilled that she wore this piece, although I'm with you Sonshine, I wish she'd chosen the pink version. I think it would have tied in better with her brown cowboy boots. Still, she looks fantastic in it - so relaxed and comfortable. The winners just keep coming on this tour! I'm so enjoying your posts. Great to get all the details. I'm a very proud Canadian, but I live on Canada's east coast (in Nova Scotia), so miss getting to see them in person. I've been to Carcross, though, and I'm glad the planners chose some varied and interesting things for William and Catherine. It's very cool that some of your other readers chose this jacket for their "dream" outfits. I love the casual look and that sweater/jacket is amazing. It looks as though they are both enjoying their trip and can't wait to see photos from today's children parties. According to People, her boots are by R. Soles. 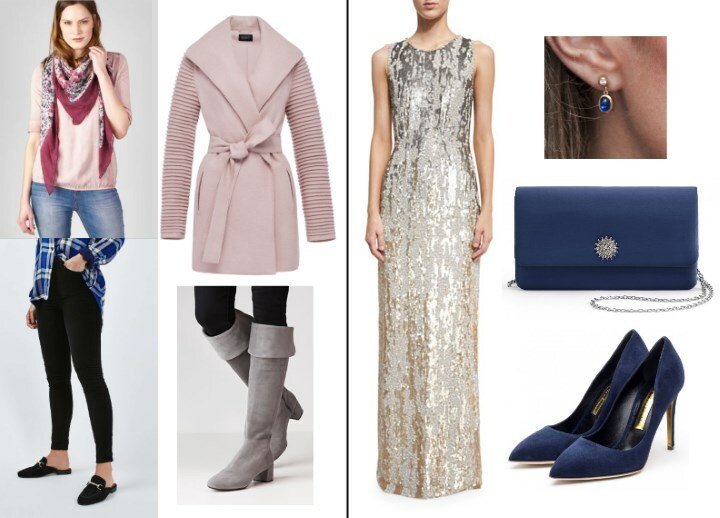 Thanks everyone for your kind words, I love this blog community and I hope we will see Kate wear even more pieces suggested for the dream looks! Hi Sonshine, NOW I see your comment! I had been scrolling through and looking for your name in the headings and not seeing it. Didn't realize you had posted as Anonymous. And my comment was a intended as a joke, and thinking about what fun it would be if Kate and/or her people checked out this blog. Perhaps they did, and chose the sweater/coat based on your dream look! Hi Pam, again no problem :) I took ot as a joke and since I usually do not comment I use anonymous and just add my moniker at the bottom. Wonderful photos - I remember on one of her early walkabouts - the one with the queen I think - and old woman reached out to embrace Kate and she pulled back slightly - obviously not sure what she should do. The lovely photos here really shows how experience is making her so much more at ease and happier in these situations - lovely of her with the little girl too. Both of them really shone on the visit. Thrilled to see the native earrings too - I was hoping she would wear some of that lovely jewellery. That train looks so much fun - it reminds me of walking in Fingal's Cave many years ago though = Quite a look down! I haven't made any comments on the tour since their arrival so I will now catch up but will endeavour to keep it as short as possible. Overall I have liked the varied outfits she has worn I was not overly keen on the flared skirt in Vancouver but the dress was youthful and appropriate. It has been good to see her in dresses rather than coat dresses and Kate's hair has been really good both down for the right events and an up do when appropriate. The dress she wore to the evening function was lovely. I was disappointed with the day in Vancouver it started off well with W&K arriving via a seaplane and walking along the front greeting as many people as possible & the first engagement with the young mother's was excellent however after that to me it seemed to turn into a PR day for the Trudeaus. Unfortunately the British Press have used W&K visit to the Syrian refugees as an opportunity to compare Canada's attitude in taking in & helping so many to Britain's efforts to date. It is unfortunately a contentious issue in England & the press made the most of it. I believe some bloggers have suggested Kate did not seem to get on too well with the Trudeaux looking back on the photos that day she seemed her normal self when chatting with them though she was a little less smiley than normal overall during the day. The day for the rainforest must have been very disappointing for both of them. From all accounts the plane flight was very unpleasant & as we know the weather atrocious. I know some readers felt Kate was not herself I was unable to open the live feed videos so cannot comment but she seemed fine in the videos I did see and in the photos. I gather from reports that the short walk they took later the air was putrid with the smell of rotting fish.. Although I am sure they enjoyed the displays that were arranged it must have been a disappointing day for them. Thankfully since then the tour has gone really well & they both appear to have really enjoyed the last couple of days interacting with both the locals & each other. The Yukon looks a fabulous area and the people have been so genuinely welcoming & pleased to see them. I hope they enjoyed their night away from the children . So far during this tour it is clear that Kate is still very much in love with William but Wiiliam's lack of any physical contact with his wife puzzles & slightly concerns me. He is naturally a tactile man very ready to greet & put arms round attractive females whether he knows them or not but never touches her in any way apart from the occasional arm on the back to guide her in the right direction. There is no doubt they are very great friends but whether William really loves her I wonder. To my mind considering the flirtatious and tactile way he behaves with other women I do have doubts. There is no doubt he loves his children he is very ready to hug them what a pity he cannot be tactile to his wife as he was in Bhutan. I look forward to the children's party I imagine Kate will be hoping young George is in a friendly mood & Charlotte interacts with the other young one's. I agree about Kate on the Bella Bella day and had commented on it that she seemed tense and I was actually wondering if the flight had been rough and if she was nervous to get back on the plane again (but comparing the situation to how I would feel, since I am a nervous flyer anyway). I completely disagree about William not being in love with Kate! I am sure he has been raised to now show "PDA" in his professional capacity. So he was tactile in Bhutan....but now now, so that means he has fallen out of love with her just within the past 5 months? Mary E, he does not have to touch her to show his love. The way he looks at her is a clear indication of that. When last did he put his arms around a beautiful woman^ Also read Berlyann's account from reporters. I think you are really off in your observations, or maybe want a scandal as British media want. 15:20- re: her "ease and happiness" being learned- The hesitation you mentioned was likely due to being with the queen, not "lack of experience." a put on act, no matter how many years one has done it. I wish I could find the pic, but I recall a VERY spontaneous hug between Kate and a lady in the crowd during the first tour of Canada. I agree with 22:23...it's there, or it's not. And Kate has it! Loved this outfit, perfect for the day's events! I wish the etsy site had a better photograph of the earrings, but it looks like they would be narrow and minimalist from the front so really like that it gives a different appearance depending on which direction you see them. I just love seeing the warm interaction William and Catherine have with the people they meet. The scenery and artwork/designs at this stop are breathtaking. I would have loved to have been a part of the visit to the totem maker. A graciously casual business top; like her hair style with it. I need to catch up With Canada's history over the week end. Thank you Charlotte. The history and other details you post are so important, image is the easiest to comment on, in a rush. Have a wonderful rest of the week and week end. PS: IMO the concept of the red dress for the reception in all its accessories is done closest by "royal fan" of hrhduchesskate blog for "the dream look for Kate in Canada"/I think the first round of style posts. If there is a vote, RF might win it this time. Does this make her consultant of this occasion? OH MY I HAVE NEVER WANTED A REPLI-KATE SO MUCH IN MY LIFE!!! NICE PREDICTION, SONSHINE!! I'll stop yelling now ;-) What a lovely day, this was. They both are beautiful, inside & out. That hug!!! It's curious that "Sonshine" has not commented and expressed her delight in Kate wearing the sweater/coat that she chose for her dream look. Perhaps s/he is someone from Kate's camp having fun with us and giving us a sneak peek at something she knew Kate would be wearing. Just a thought that crossed my mind! I just counted FOUR replies from Sonshine up above, thanking us for our congratulations! Finally found your comments, Sonshine. Hadn't realized you posted as Anonymous so was searching through the headings. Anyway, congratulations on Kate choosing your look. What fun! I usually only read, don't comment, and I haven't had time to reply to anyone yet. I am still so thrilles that she wore this coat, I adore it! I love this coat! I was eyeing it up after Sophie Gregoire-Trudeau wore the brand to her husband's swearing in. I was so sad that it cost so much but it looks fabulous on Kate. Casual perfection. Her hair then brings up the formality and I love that too. Her updos are incredible. I'm not a huge fan of the Cowboy boots. I'm Canadian, and from Alberta so I understand the love of western wear. For the Stampede, cowboy boots were perfect. There's nothing else to wear to that event, IMO. Whitehorse is definitely a western northern town and there is nothing inappropriate about the boots. I just don't like them. Her chivers boots would have been perfect here. return to Charlotte's "LIVE BLOG" page, scroll down and find light blue wording that says "CTV Live Stream", tap on that, and voila'. politics is on live feed, not play date. Pam 17:50- see anon 13:11- "sonshine." Thank you...I found it! I don't have time to read all of the comments that are posted here so had been looking for Sonshine under the headings and not realizing s/he posted as Anonymous. The photo of Mrs. Wally and Kate is precious. It brought tears to my eyes. It was really gracious of Kate to receive her. These types of connections are so important to build positive relations between people. What a special moment for both! Love this outfit! Looks amazing! Wow Sunshone pin pointed precisely the coat. What a prediction/indeed a winner of Canada's dream look of one of the categories.